Instead of crowding into one or two rooms in a hotel, you will have my entire house to relax in after an active day at the theme parks. Just imagine coming back after a busy day at Disney World and swimming in your very own heated private pool (hotel pools close by 10pm) as our pool never closes. Many people would think that these accommodations are out of reach for most families, but the surprising truth is you can rent my house for less than the price of two standard hotel rooms! For families and even groups traveling together, renting a pool home is an excellent choice for accommodations in the Disney World area. Kids love staying at my home—so do their parents! Join the many happy families that have enjoyed their vacations at my home. Imagine the comfort and privacy that staying in my house affords. When you arrive, you will be impressed by the beautiful tropical exterior. I particularly love the palm trees. The neighborhood is quiet and upscale. Besides being so close to Disney World, there is every sort of restaurant, drugstore and three supermarkets located within a few miles of the home. Sea World and Universal Studios are easily accessed via Route 4. In addition, nearby are Reunion Golf Resort and Champion’s Gate Golf Resort, not to mention numerous other first-rate golf courses. There are courses in the area for every golfer’s ability and wallet. Open the front door and enter the living room. You may want to sit in this room when you want a little adult quiet time away from the rest of the family. The living room is bright and cheerful. Passing through the dining room you arrive in the kitchen. I don't want to spend too much of my time in the kitchen while I am on vacation, better to spend it outdoors on the grill; but if you want to cook, you have the equipment to prepare the most elaborate of meals. And of course, there is a dishwasher. When traveling with the family the full kitchen is a wonderful thing to have. You won't have to eat every meal at a restaurant- unless you want to. You'll really appreciate the convenience when there are children in the group. They can eat when they want- which can be at all hours with all the fun they'll be having. Have a finicky eater? Make the food that they like and get back quickly to vacationing. Off of the kitchen is the laundry room with washer, dryer. We really enjoy our breakfasts together. The one meal we always eat at the house is breakfast. It has become a family tradition. The first person awake makes the coffee... at least the first pot! The family room is a favorite gathering place. There is room for everyone to sit together and enjoy talking about our day. Sometimes we watch TV or movies (Netflix), or even listen to CDs on the stereo. Our family loves to play games together after a day at Walt Disney World- if we're not swimming in the pool. You have your choice of board games, or video games (PS3). Provided in the family room are board games for all ages such as Trouble, Monopoly, Candyland and Checkers. There is even a game table in the corner of the room on which to play. Also, there are a few Disney movies to keep the young or young at heart occupied on rainy days. The house has a sleeping capacity for ten people. A split floor plan allows for maximum privacy with four bedrooms and three bathrooms located in three different areas of the house. In the front of the house off of the living room, is the master bedroom with a king bed, TV, walk in closet and a private bath with water closet, tub, shower and double sink vanity. The second bedroom, at the back of the house, has a queen bed. It has its own bath across the hall, which opens out to the pool. In the middle of the house, bedroom three has another queen bed and bedroom four has two twin beds. Located between these two bedrooms, is the third bath. In addition to the bedrooms, a living room sofa bed sleeps two. A crib and booster is available at no charge. Basic supplies of filters, ground coffee supplied. Large table that can expand to allow seating for 10 people. So close to Disney you can hear the fireworks! A little further to go to Universal Studios, and about 1.1/2 hour drive to the beach. Ask about the best beaches to visit. And enjoy shopping at the outlet malls and meals at the many restaurants nearby. To complete the pleasure of your stay we have a game table, board games and video movies, two TV's,Stereo w/CD Player, Air Conditioning and ceiling fans. 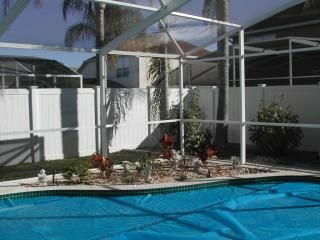 The pool side furniture is in the lanai area, for sun tanning, and is complete with table and poolside plastic plates and glasses. The garden patio is equiped with full size gas BBQ for total outdoor enjoyment. Maid service at the end of your stay, and pool heat is included in the price. If your require Crib and High Chair, please request at time of booking. These will be provided at no charge. We have two baby strollers available as well. water parks, helicopter rides and horseback riding. St. Petersburg. Ask for our top recommendations. please e-mail us your request. We do not charge extra for pool heat when you need it.